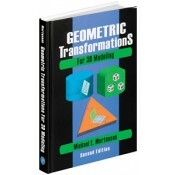 Delivering the theory and application of geometric transformations is the comprehensive mission of Geometric Transformations for 3D Modeling by Michael E Mortenson. The 380 page hardcover volume is the second edition. It provides a thorough introduction. Written from the standpoint of transformation mathematics, the content is accessible by students, teachers and professionals in the field. It is also ideal for practitioners in engineering, math and physics beyond the manufacturing industry. The first three chapters provide needed abstract foundation material and theory to cue up actual transformations in subsequent chapters. The author's approach reduces the clutter of theoretical derivation in the remaining text. Mortenson introduces operational and application-centered tools and concepts as the need dictates. The volume assumes that readers are already familiar with analytic geometry and first-year calculus. Readers should also possess basic working knowledge of matrix and vector algebra. With these prerequisites, Geometric Transformations for 3D Modeling will appeal to anyone working in 3D and geometric modeling, computer graphics, animation, robotics and kinematics.